At the risk of sounding like a) a nerd and b) a really weird nerd, the Wars of the Roses are my favourite wars. They've got everything: complicated dynasties full of jealousy and resentment, political scheming, a divided nation, family feuds, innumerable fascinating personalities, unlikely love stories, surprising ascents to power and a great deal of violence. I don't think you could want much more. 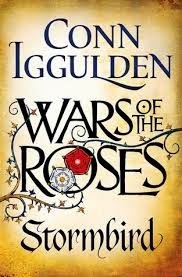 For this reason I was particularly keen to read Stormbird, the first novel in a planned series of Wars of the Roses historical epics by Conn Iggulden, and I'm delighted to say I wasn't disappointed. Although many of the characters and events depicted in Stormbird are very much real, don't expect this to be Wolf Hall: if anything, it's more comparable to A Game of Thrones. Rather than making a single individual the centre of the story, Iggulden gives us large cast of characters, all with different perspectives on the events that unfold. Among them are Margaret of Anjou, a teenage bride from France married off to the oddly simple-minded English king Henry VI; Derry Brewer, his pragmatic advisor and rebel leader Jack Cade, among others. Margaret, perhaps, stands out the most for me; her ability to extract the best from her situation and her gradual increase in confidence and strength is impressive. The writing is sharp and vivid throughout, and the dialogue feels fresh and natural without losing its sense of time and place. Stormbird is nothing if not action-packed; the (numerous) battle and combat scenes are a grisly rollercoaster ride and the story proceeds at a rollicking pace. However, there is more to it: all the characters are three-dimensional and well-developed and the novel is rich with vivid historical detail too. Moreover, by looking at the impact of the events that begin the Wars of the Roses on every level of society, the novel gives a wider context to the events we know from history lessons and gives an interesting insight into the effects of the conflict on individuals on both sides of the English Channel. I'm looking forward to the next instalment in this epic tale.